While our friends further south and southwest struggle to recover from Hurricane Harvey and Hurricane Irma, Jose lurks in the Atlantic and Maria isn’t far behind. Mother Nature isn’t always kind, but lately she’s certainly been consistent at making sure the ground stays moist and the sky stay turbulent. While we can’t stop a hurricane or even fully fathom the destruction they cause, SOME OF YOU may be wondering — where do the bugs and birds go in such a big storm? It seems the birds and bugs in the eye of the hurricane could be a common occurance. Many of us know that Hurricanes are humongous tropical storms that can span a distance of 600 miles or more. There’s one part of a hurricane where things are quite different, though. It’s called the eye, and it usually exists in the center of a hurricane. The eye can vary greatly in terms of both shape and size. 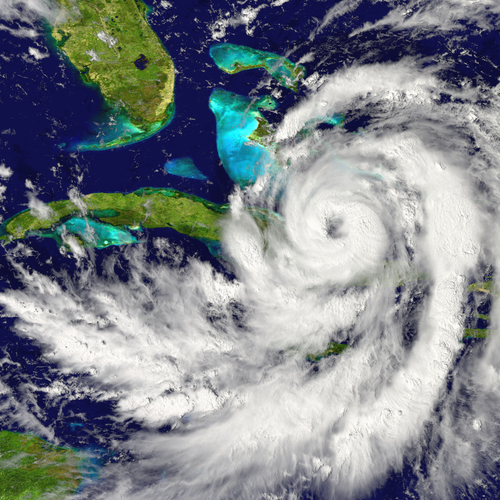 The eye of a hurricane is often circular or oval in shape. This may be why it’s called an eye, since it’s shaped somewhat like a human eye. A hurricane’s eye can be as small as only a couple of miles wide. Most hurricane eyes, however, range in size from 20 miles wide to more than 60 miles wide. Unlike the raging winds that exist throughout the rest of a hurricane, inside the eye it’s mostly calm. The peaceful, light winds within the eye contrast severely with the winds that make up the edges, known as the eyewall. The winds in the eyewall are usually the most severe and destructive winds in the entire hurricane. Birds and bugs are often seen in the eye of a hurricane and for pretty understandable reasons. When they start getting caught up in whipping winds, they naturally move to where there is some calm. It just so happens in a hurricane, this is the eye of the storm. Hurricanes are not only devastating to humans but also to wildlife. Large storms can accidentally release invasive species, eliminate food sources, and strand aquatic species on land if they get stuck in a storm surge. The states that have been recently affected by hurricanes were left with a great deal of flooding. Standing water and still warm weather makes for the ideal breeding ground for mosquitoes. 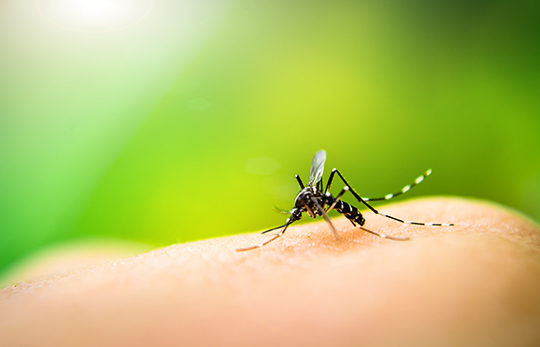 Based on experience following Hurricane Katrina, there will be several competing effects on the population of mosquitoes and the prevalence of arboviruses, such as Zika, dengue and West Nile, that they transmit. Mosquitoes need stagnant water to lay eggs. Winds and floods will wash away containers that would have been breeding pools, but once the floodwaters recede, mosquitoes will recover. In 2006, a year after Katrina, Tulane University public-health experts reported that cases of West Nile infection increased more than twofold in communities that had been in that hurricane’s path. The study authors suggested that increased exposure was the culprit. Fleeing partially submerged buildings, people spent days outside waiting for rescue. Without air conditioning or dry spaces, Texans and Floridians may find themselves outdoors, too. If Virginia sees more rain from the hurricane season before temperatures drop, we may very well see an extension of mosquito season as well. CONTACT Holistic Pest Solutions to learn more about our mosquito treatment plans or give us a call at 434 842 1700. Whether you’re in Charlottesville, Waynesboro, or close by to either, Holistic Pest Solutions has the perfect plan for you that is as Green As You Wanna Be! Do stink bugs really stink? Yes, stink bugs really do stink. A tiny gland located on their thorax between the first and second pair of legs emits a liquid toxin with the pungent odor (described by some as similar to that of smelly feet) that is their primary defense. This odor acts as a repellent to birds or any other predator that might threaten the stink bugs—including humans. Stink bugs release their odor when chased, picked up, or stepped on. If you have a lot of them in your house, the smell tends to linger (fortunately it can be eliminated by washing down the surfaces with ordinary soap and water). Why Are There So Many Stink Bugs? Stink bugs reproduce 4 times a year. Each time a stink bug reproduces, it lays between 20-30 eggs on tree and other plant leaves. Stink bugs undergo metamorphosis in three stages: egg, nymph and adult. The eggs are laid in groups on stems and the undersides of leaves. When nymphs emerge, they look similar to the adult stink bug, but may appear rounder rather than shield-shaped. Nymphs go through five instars before becoming adults, usually in 4-5 weeks. The adult stink bug overwinters under boards, logs or leaf litter. In some species, the nymphs may also overwinter. With no natural predators in the United States, multiple reproductive cycles, fast development and an ability to travel easily (hitching rides on buses and in construction materials), the numbers of stink bugs have exploded, and they’re spreading fast across the country. What Makes Stink Bugs Such A Nuisance? 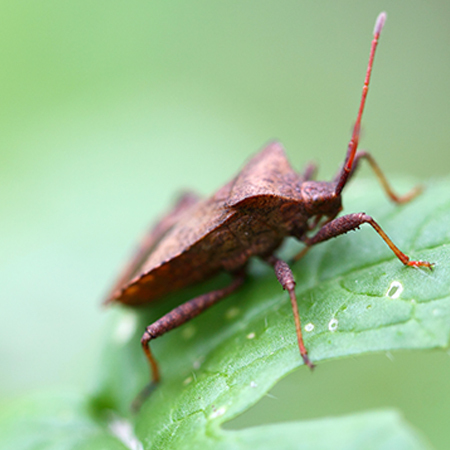 While stink bugs are NOT known for biting, stinging, or carrying diseases, they will gobble up your fruits and veggies – and even your ornamental trees and shrubs. What’s even more annoying to urban dwellers is their propensity for moving in: when the weather gets cold, they seek shelter in detached homes and apartment and office buildings alike, sneaking in through cracks, screenless windows and any other openings. And because they’re resistant to most conventional pesticides and small enough to hide almost anywhere, once they’re in, they’re tough to get out. What Is The “Peak Season” For Stink Bugs? Because stink bugs won’t reproduce indoors and their food is mostly outdoors, they won’t try to move into until it starts to get cold – usually around late September/early October. 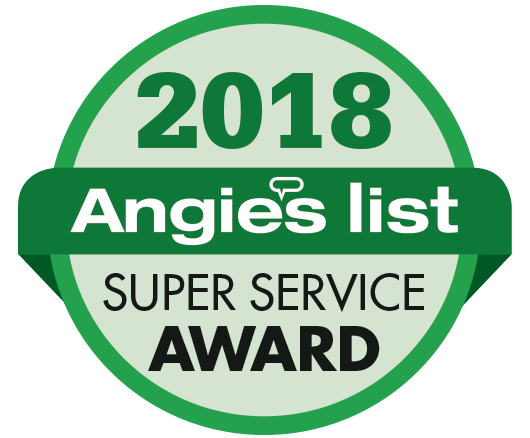 The insects sneak in through small cracks and openings in chimneys, door and window frames, air conditioning units, attic vents and holes in a home’s foundation. They hide out in toasty, dark spots during the winter, and emerge from hibernation late in the Spring. That’s when you’ll notice them become active again. If you want to avoid Stink bug infestation in your home or office, the best time to get treatment is PRIOR to cold weather – September is probably the ideal month here in Virginia. What’s The Best Way To Get Rid Of Stink Bugs? Whatever you do, don’t smash them – not only do they smell bad, their distinctive odor attracts others of their kind. In addition to deterring predators, a stink bug’s odor sends a chemical message to other stink bugs, alerting them to danger. The scent glands also play a role in attracting mates, and even suppress attacks by harmful microorganisms. CONTACT Holistic Pest Solutions to learn more about our stink bug treatment plans or give us a call at 434 842 1700. Whether you’re in Charlottesville, Waynesboro, or close by to either, Holistic Pest Solutions has the perfect plan for you that is as Green As You Wanna Be!